This is the papers page for Ian Grigg, and joint authors. Each of these papers has been written and circulated with some seriousness in various fora. Many have been published in some formal academic conference or journal. Sorted in most recent first. A blockchain is a platform controlled only by software rules, often termed a permissionless ledger. As the corporate world has entered into this new territory, it has modified the original vision to create permissioned blockchains. This mechanism, deployed to control anarchic and fraudulent behaviour, both, is familiar and effective, but comes with costs - it shuts out the small business, the engine of growth and innovation. What would a blockchain for small business look like? From 1st principles, business needs a stable and safe environment, one in which its community is for it not against it. The missing element is the trust that a community can work together to resolve a disaster. As blockchain isn’t that environment, the big money waits on the sidelines. To build trust onto a blockchain, we add a modicum of classical institutions of governance: a set of rules, and mechanisms to keep people within the rules. But, crucially, we do not need to build a wall around to lock small business out. We call the result The Governed Blockchain as a 3rd alternative to permissioned versus permissionless ledgers. It preserves the free entry of open blockchains, but imposes rules of behaviour within the blockchain’s Constitution, and methods to feedback responsibility on bad behaviour. The Governed Blockchain invites the entrepreneur in to build a business with some basic level of safety and security, that their business will not be destroyed by black swans and other disasters. It invites capital to deploy into blockchain to build business, where before, entrepreneurs were holding back. 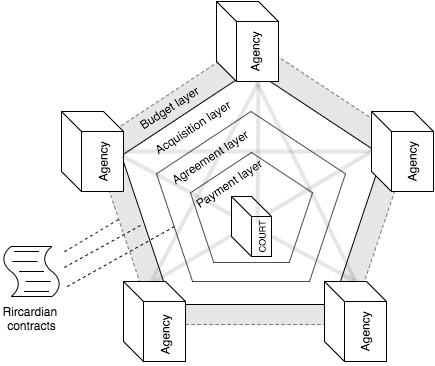 This paper came out of my work on the EOS blockchain, as a way to explain why the governed approach was fundamentally different, and why this was a useful direction in blockchain affairs. The concepts which derived heavily from CAcert experience can be applied to any blockchain or any community. NortonRoseFulbright's Adam Sanitt and I collaborated on a critique on the above paper: Legal analysis of the governed blockchain (PDF). Now also translated to Chinese - Part I - 受治理区块链的法律分析 and Part II by 翻译Joey and 校对Lochaiching of EOSShenzhen Many Thanks! Legislation generally requires public agencies to account for their activity to the public. Among the many duties imposed by legislatures around the world are requirements for transparency in procurement of services, budgeting and presentation of accounts. However, agencies in countries with high corruption problems have trouble complying with the legislation, especially in smaller agencies. Moreover, it is typically infeasible for national auditors to audit all the accounts rendered, and instead, they select a small sample for audit based on their level of risk. Another problem is that the presentation of accounts occurs once a year for all agencies, leading to a seasonal demand with significant lag time between auditing and accounting period. In this study, we present a non-technical framework based on the emerging technology of blockchain that could be a solution to all these concerns. We apply it within the context of Brazilian legislation and the Federal Court of Accounts of Brazil (TCU), although the proposal is applicable across a wide range of countries facing severe corruption. This paper is published in the peer review journal International Journal of Auditing Technology, which can be purchased here. The DRAFT submitted is downloadable as Triple entry ledgers with blockchain for auditing (PDF) from this papers page. Abstract: Current technologies for blockchain fall short of providing what developers and end-users need in order to contract together and to build large scale businesses. We propose EOS, a performance-based and self-governing blockchain that provides an operating system for building large-scale consumer-facing distributed applications. This paper outlines the context, vision and software architecture underlying EOS, which we are building to serve a broad and diverse group of users with smart business. Аннотация—Современные блокчейн-технологии вплотную подошли к тому, чтобы обеспечить разработчиков и конечных пользователей всем необходимым для заключения контрактов и создания крупномасштабных бизнесов. Мы предлагаем EOS, ориентированный на производительность самоуправляемый блокчейн, предоставляющий операционную систему для разработки крупномасштабных, ориентированных на потребителя распределенных приложений. Эта бумага описывает контекст, вИдение и программную архитектуру, закладываемую в EOS, которая строится нами для широкого круга различных применений в смарт-бизнесе. Resumen – Las tecnologías actuales para blockchain (cadena de bloques) no logran cumplir todo aquello que los desarrolladores y los usuarios finales requieren para establecer de forma satisfactoria contratos que les permita construir negocios de gran escala. Proponemos EOS, una blockchain basada en rendimiento y en auto-gobernanza que brinda un sistema operativo para construir aplicaciones distribuidas de gran escala orientadas al consumidor. El presente documento describe el contexto, la visión y la arquitectura del software del sistema EOS que estamos construyendo para servir a un amplio y diverso grupo de usuarios con negocios inteligentes. This paper was written over the EOS.io blockchain technology. If you have comments, send them in to the normal iang @ address, or put them on the fc blog (with boring SSL drama). Printed "black edition" has a nice black cover, distribted at FintechWeek and China meetups. Russian: EOS — Введение (Ян Григг) (часть 1) & (часть 2) by 🌐 Blockchained. Chinese: EOS 介绍 by the Chinese EOS community! Thanks! Yvonne also did mindmap summary in Chinese and English. Spanish: EOS Una Introducción traducido por María A. Maegli y Ana I. Herrerías, with support from eosMeso! Muchisimos Gracias! 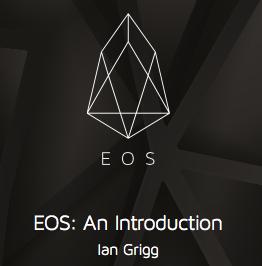 Slides: EOS - An Introduction - Slides used in the Beijing presentation. Another copy is on EOS: An Introduction (eos.io copy). Ian Grigg, Identity in Depth , 2017 published by R3. 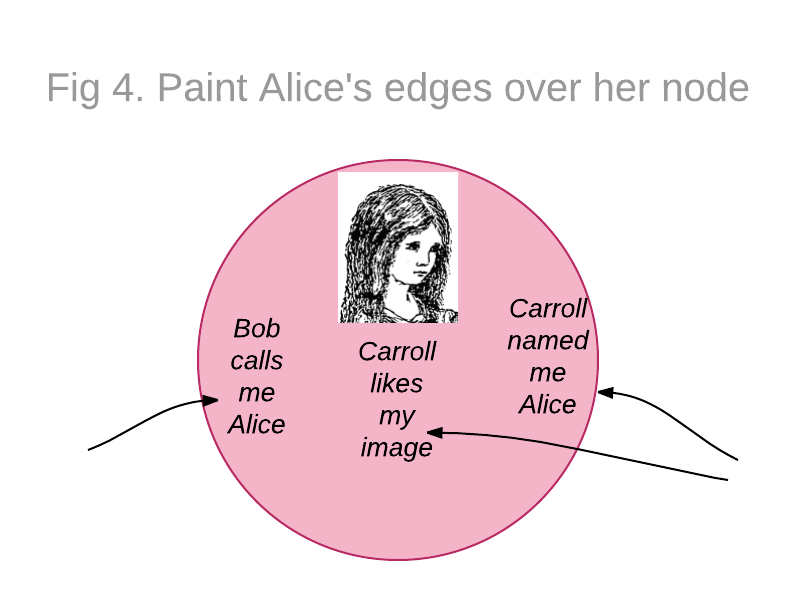 Identity is an Edge Protocol - in that, identity as a computing system is about what one person says about another. Therefore the core of an identity system is to support reliable statements from person to person. 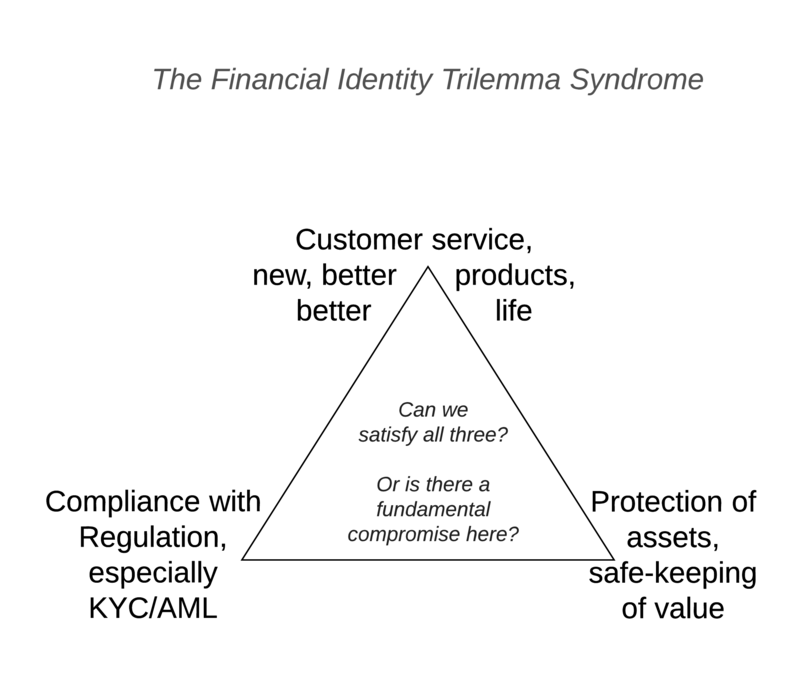 An Exploration of Identity - facing up to the Financial Identity Trilemma Syndrome requires identifying the deadly embrace of customer service, compliance and asset protection. Banks are currently squeezed by higher compliance levels, so something has to give. But is it possible to have ones cake and eat it too? This exploration explains how a customer-centric identity solution will release the banks from their trilemma. 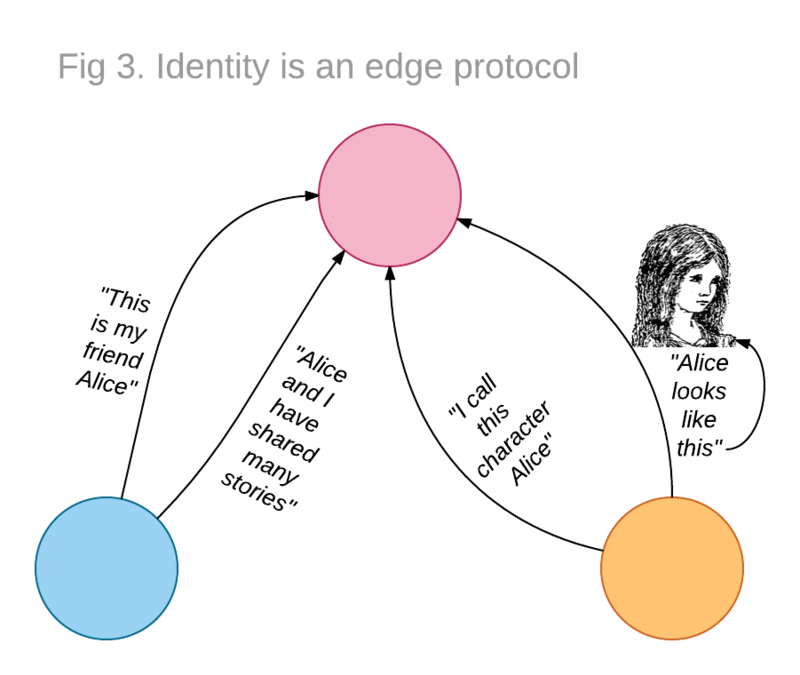 These two essays were originally published separately as Identity as an Edge Protocol and An Exploration of Identity by the R3 consortium for financial services blockchain. Now available as a single report, they might be considered to be teasers or alternative views on the evolving Identity Cycle. The design is going to make its appearance in ChamaPesa. A distributed ledger made up of mutually distrusting nodes would allow for a single global database that records the state of deals and obligations between institutions and people. This would eliminate much of the manual, time consuming effort currently required to keep disparate ledgers synchronised with each other. It would also allow for greater levels of code sharing than presently used in the financial industry, reducing the cost of financial services for everyone. We present Corda, a platform which is designed to achieve these goals. This paper provides a high level introduction intended for the general reader. A forthcoming technical white paper elaborates on the design and fundamental architectural decisions. In PDF. Also see a short blog post. Bitcoin’s inclusion of the smart contract form invented by Nick Szabo has thrust this design into the forefront. An alternate design, the Ricardian Contract designed by the present author, is currently used by a few innovatory systems such as OpenTransactions, OpenBazaar, Askemos and CommonAccord. Mark Miller sees these as two halves of a split contract, but a more popular view is to see it as an either/or choice. So let’s try that out: which should you choose? 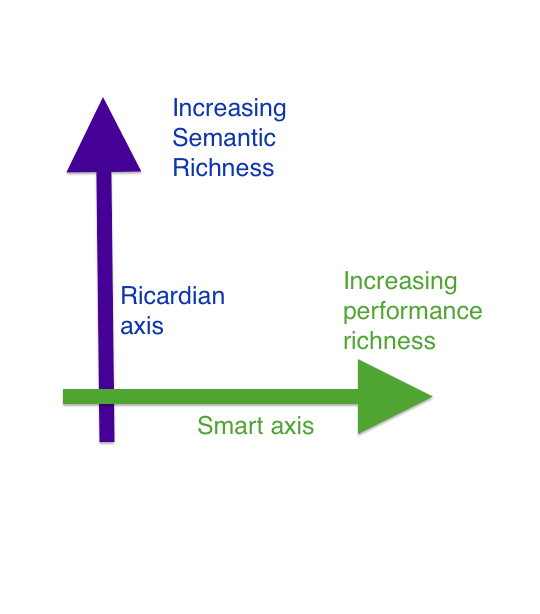 Smart or Ricardian? Let’s find out. Ian Grigg, The Sum of All Chains - Let's Converge! In which I apply the Ricardian Contract ideas to solving the problem of too many chains, and in the process create a network object design pattern now apparently tagged as The Ricardian Triple, which provides design direction for smart contracts, identity, IoT and chains. The third, a retrospective, is in production. Also, see my reading page and the new Wikipedia article on Ricardian contract and contribute to make it a primary introduction. Bitcoin has a high latency for verifying transactions, by design. Averaging around 8 minutes, such high latency does not resonate with the needs of financial traders for speed, and it opens the door for time-based arbitrage weaknesses such as market timing attacks. Although perhaps tractable in some markets such as peer to peer payments, the Achilles heel of latency makes Bitcoin unsuitable for direct trading of financial assets, and ventures seeking to exploit the market for financial assets will need to overcome this burden. As below, developments moved fast on this question, and there are now more ventures looking at the contracts and trading question. For clarification, I am the secondary author, Ken is lead. Comments can be placed on FC's announce post (in SSL only). It was written in December of 2013, and published here in Feb 2014. The Bitcoin economy exhibits remarkable and predictable stability on the supply side based on the power costs of mining. However, that stability is challenged if cost-curve assumption is not solely expressed by the fair cost of power. As there is at least one major player, the botnets, that can operate at a power-cost-curve of zero, the result is a breach of Gresham's Law: stolen electricity will drive out honest mining. This has unfortunate effects for the stability of the Bitcoin economy, and the result is inevitable collapse. Events overtook this paper. We had hoped to present it at some interesting conference, but with the development of full-scale attacks on the Bitcoin economy, it is better out now, so as to explain the reasons. This does not preclude a later publication - this paper is still in draft in the freer sense of FC++ (comments welcome on the SSL version of the blog). How does a lightweight community Certification Authority ("CA") engage in the heavyweight world of PKI and secure browsing? This talk tracks the systems audit of CAcert, an open-membership CA, as a case study in auditing versus the open Internet, community versus professionalism, quality versus enthusiasm. It will walk through the background of "what, why, wherefore an audit," look at how CAcert found itself at this point, and then walk through some big ticket items: risks/liabilities/obligations; assurance and what's in a name; disputes and reliance; and systems and security. Can CAcert deliver on its goal of free certs? The audit is into its 3rd year as of this writing; and remains incomplete. Some parts are going well, and other parts are not; by the end of the year 2008, we should be able to check all of the important areas, or rethink the process completely. Hence, finally, the talk will close with progress and status, and recommendations for the future. Presented as an invited talk at the 22nd Large Installation Systems Administration Conference (LISA 2008) 13th November 2008. Above is HTML with slides embedded within; also available are the slides in extracted form. See also the CAcert and the audit page. Abstract. As a good in the sense of economics, security is now recognised as being one for which our knowledge is poor. As with safety goods, events of utility tend to be destructive, yet unlike safety goods, the performance of the good is very hard to test. The roles of participants are complicated by the inclusion of agressive attackers, and buyers and sellers that interchange. This essay hypothesises that security is a good with insufficient information, and rejects the assumption that security fits in the market for goods with asymmetric information. Security can be viewed as a market where neither buyer nor seller has sufficient information to be able to make a rational buying decision. Drawing heavily from Michael Spence's Job Market Signaling, these characteristics lead to the arisal of a market in silver bullets as participants herd in search of best practices, a common set of goods that arises more to reduce the costs of externalities rather than achieve benefits in security itself. This paper is part of a group of papers emerging from an investigation into Information Security and Signalling. This is a difficult paper, and is advancing slowly, but I think its proposals are very important. See also the (complete) Pareto-Secure paper below. Abstract. Describing digital value for payment systems is not a trivial task. Simplistic methods of using numbers or country codes to describe currencies, and ticker tape symbols to issue bonds, shares, and other financial instruments soon run into shortcomings in their ability to handle dynamic and divergent demands. The seemingly arbitrary variations in the meanings of different instruments are best captured as contracts between issuers and holders. Thus, the digital issuance of instruments can be viewed as the issuance of contracts. This paper proposes that the contract is the issue. A document form is described that encompasses the inherent contractual nature of the financial instrument yet copes with the requirements of being an integral part of a payment system. Kindly presented by Mark Miller at First IEEE International Workshop on Electronic Contracting, (WEC) 6th July 2004. Above is HTML, original submitted in multicolumn DOC form. also available is PS. See also the reading page and the new Wikipedia article on Ricardian contract and contribute to make it a primary introduction. Abstract. What do people mean when they say something is secure? Pareto-Secure was one of the three papers presented in the founding issue of Advances in Financial Cryptography . As editor, publisher and chief gopher that was an easy decision for me! FC++ as it is known for short is a pre-publication drafts circle designed to polish our work before going out to a 'real publication'. Abstract. The digitally signed receipt, an innovation from financial cryptography, presents a challenge to classical double entry bookkeeping. Rather than compete, the two melded together form a stronger system. Expanding the usage of accounting into the wider domain of digital cash gives 3 local entries for each of 3 roles, the result of which I call triple entry accounting. A new paper that attempts to meld our ground-breaking digital issuance innovations with classical accountancy. In Financial Cryptography it is an article of faith that double entry bookkeeping has taken a broadside from the digital certificate, and is expected to sink any year now. Instead, I look at how the two can work together and emerge stronger for their contributions. Now translated and available: 三式记账法 (Triple Entry Accounting) in Chinese! Also, alternate location: 三式记账法 (Triple Entry Accounting) in Chinese!. Translation kindly done by shuke0327. Triple Entry Accounting was one (which earnt lots of comments) of the three papers presented in the second issue of Advances in Financial Cryptography . Abstract. Mutual funds are vulnerable to abuses involving market timing and late trading. Primarily, this is due to a failure of governance, and the delayed nature of settlement of both payments and transfers. This vulnerability is only exploited over time, through a progression of small steps that, individually, raise no alarm, but in sum, cross the line of acceptable behaviour. Solutions to the abuses will be found not in more regulation, but in open governance and a move towards real time gross settlement. This paper was submitted as testimony to the U.S. Senate's finance subcommittee during hearings on the mutual funds scandal (dead link?) , 27th January 2004. Above is HTML, original submitted in PDF form (local and also senate copy), also available is PS. Also see the in-person testimony before the hearings. I seek to reduce complexity by presenting Financial Cryptography in a 7 layer model. This model separates the field into distinct disciplines of Finance, Value, Governance, Accounting, Rights, Software Engineering, and Cryptography. I also present Systemics' Ricardo system in the light of this model, as an example. The paper was presented at Financial Cryptography 2000 (FC00) and was originally published in the Proceedings of Financial Cryptography Fourth International Conference , FC 2000 Anguilla, British West Indies, February 21-24, 2000, Springer-Verlag LNCS 1962. Here is the postscript. I survey the current state of the art in digital trading and brokerages. I also document some of Systemics' experiences in digital certificate trading, and draw the conclusion that future trading will be open and costless. This predicted future may not come pass, but it will serve as a benchmark for the financial world as it enters into an era of rapid and dramatic structural change. It was presented at the first Digital Money conference, London, October 1997, and appeared in the November 1997 issue of Virtual Finance Report . Here is the postscript. This is our controversial proposal to automate the division and distribution of labour. Where Marx has failed, Markets can succeed! By allocating ownership of software projects as fungible units, we seek to use digital value systems to assist in raising funds for open source software. It was presented at Financial Cryptography 1997 (FC97) and was originally published in the Proceedings of Financial Cryptography First International Conference , FC'97 Anguilla, British West Indies, February 1997. Springer-Verlag LNCS 1318. Here is the postscript. A viewpoint on what's happening in the European Internet Cash policy arena, and why it represents a bad move for Europe. published in The Journal of Internet Banking and Commerce , Vol 2, Num 2 March 1997. For more information on the European debate, see my Money Page. Here is the postscript. Argues that, in actuality, Internet cash issuance will not be a strong force, neither against the tools of monetary policy, nor for its own mercantile purposes. Three models are used: Fractional banking, Baumol-Tobin, and potential participancy. This paper was written in April-June 1996 as primary assessment for Professor Michael Kuczynski's International Financial Systems elective in the London's MBA programme. As it was a hot topic at the time, and this was only the second paper on the subject, I published it on the web. Here is the postscript. This page includes all completed or published papers. Some non-complete papers on on the draft list. In the above, the blue colour indicated a more formal process which is known as "peer review," whereas the pink colour represents open publication. I don't think the difference is important any more. Also see the Financial Cryptography Blog, my Money Page for the various older reports and links on electronic money, and Advances in Financial Cryptography peer-review circle for contemporay thought expressed in working and draft papers.